Two fab cards, Sylvie...both really lovely in different ways:) Your first ard would be great for a new home. It looks like you've been having a lot of fun with die cuts and punches Sylvie. These are great. 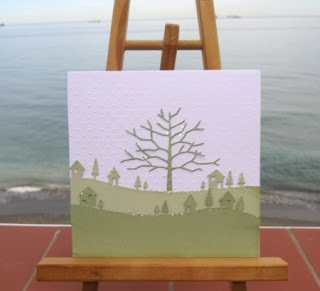 There's something which doesn't seem quite right about the tree on the first card, I thought at first that it was the position, but I think it's because it looks rather out of proportion compared with the houses and the other trees... just my thoughts you understand! The Treasure Hunt sounded great fun... but what was the treasure? Two lovely cards Sylvie, I love how different the first one looks in comparison to the black and white christmas one a couple of posts ago. I may have to invest in that die:) I'm going to Ally Pally on saturday so we may catch sight of each other! We should have LIM badges as there seems to be quite a few Limettes going! Lovely cards, the first could certainly be a blokes birthday card as its very smart....or "branching out" :-) for someone setting out on a new venture!!! What a great job with this challenge, Sylvie! All your green card are fabulous from the French Foliage to the die cuts to the flowers punched from the green, embossed pieces. You seem to be really embracing the green this week!! I do rather like the bold squares of the second card and the rounded corners change the look so dramatically. You can view my card here. Great cards, I like the second one the most. Your CAS style is perfect. Two lovely cards! I really love how you used the dies on the first card...very creative! ooh, Sylvie! I love both of these very much, particularly the first (I have a bit of an obsession with trees!)Fabulous! These are really very gorgeous cards. I just love the color combination as green is my favorite color. They are also nicely decorated. Great creation. Thanks for sharing. 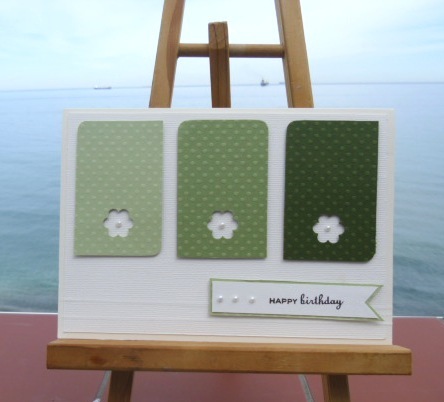 Two fab cards - those memory box dies are just lovely! Pink ribbon & die cut Bingo!!! Less is More Love My Greens!! !